Kings Langley wide man Stevie Ward scored with a beautiful lob on Saturday but Taunton held on for a 2-1 victory. The loss at second-placed Taunton leaves them in sixth place in the Evo Stik Southern League Premier Division South and just outside the play-off positions on goal difference to fifth-placed Poole Town. They still have three games left to overturn the standings and will be aiming to beat Dorchester Town, Walton Casuals and Frome Town, while hoping Poole slip-up in their three remaining jaunts. Kings were left lamenting what might have been on Saturday as a spirited second-half fightback failed to glean them a share of the spoils at high-flying Taunton. The visitors started brightly enough and a slick early interchange between Mitchell Weiss and Stevie Ward saw the Kings wide man round home keeper Lloyd Irish only to be denied a goal by an offside flag. The hosts were quick to respond with their own attacking intent and the match continued apace with both teams looking to seize the initiative. But as is so often the case in tight contests, luck can be a determining factor and prolific Taunton striker Rocky Neal was the beneficiary when the ball took a fortunate ricochet to him and he drove the ball low into the corner in a flash. 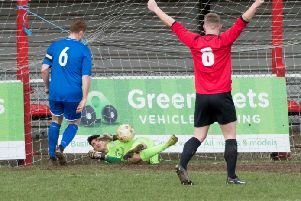 The goal rocked Kings and worse was to follow seven minutes’ later when Neal was again to the fore when he latched onto a misplaced clearance and hit a great strike that beat the back-peddling Langley keeper Alex Tokarczyk. Kings were down but not out and could well have reduced the arrears just before half-time when an incisive run into the box by Ward was brought to an abrupt halt by the challenge of Lewis Hall that left the forward sprawling – but nothing was given by the officals. Kings started the second period positively with Weiss and Rohdell Gordon stinging the palms of Irish with snap-shots but the home defence was resilient in the face of increased Kings pressure. That was until the 61st minute when Dean Hitchcock’s perceptive pass was nodded down by Weiss to Ward, who put the most exquisite of lobs over Irish to make it 2-1. The hosts replied and only a great reflex save by Tokarczyk from a Shane White header prevented restoration of their two-goal cushion. Kings battled to the end but Taunton saw out the remaining minutes without further alarm, leaving Kings to reflect on a missed chance in their hopes to reach the playoffs. This Saturday sees Kings host 15th-placed Dorchester, while their playoff rivals Pool have a difficult away fixture at third-ranked Metropolitan Police. Kings then visit relegation-threatened Walton on Easter Monday.